Product Description: Academy Award winner James Cagney gives an unforgettable performance as Lon Chaney in this fascinating true story that follows the life of one of the most iconic and mysterious stars in Hollywood history! Known as the "Man of a Thousand Faces" silent film star Lon Chaney captured the imagination of the world through his incredibly expressive and transformative roles such as Quasimodo in The Hunchback of Notre Dame and the Phantom from the original Phantom of the Opera. Behind the scenes however this long-suffering talented genius' life was filled with trials and tribulations that helped shape some of his most groundbreaking roles. 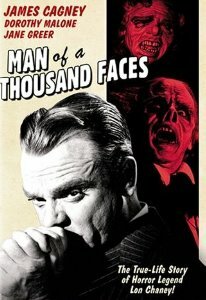 The Academy Award -nominated Man of a Thousand Faces captures the dramatic private life of a humble vaudeville clown who rose to become one of the biggest stars the world has ever seen! One of the difficulties in producing a Hollywood biopic is recreating iconic movie images with which the audience is already familiar. 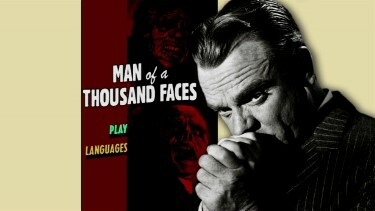 Man of a Thousand Faces had the formidable challenge of depicting the famous makeup achievements of Chaney, and even the title of the film pointed to the importance of carrying them off. The resulting recreations, though, were seen by most as a failure. One of the reasons for their weakness is basic ¿ while Chaney had a thin, lean face, Cagney's was rounded and full, making Cagney an unlikely candidate for elaborate makeup in the first place. The movie's recreations also point out the changes that had occurred in that particular field by the late 1950s. At that time Bud Westmore was head of the Universal makeup department, having replaced Jack Pierce in 1946. Pierce created the look of the classic Universal monsters such as the Wolfman, the Mummy and Frankenstein's Monster, using a laborious "built-up" method requiring cotton and collodion. Chaney had worked with those materials too, but he was also able to use more drastic (and sometimes painful) methods to distort his features with glues, adhesives, and monofilament lines. With these, he was able to distend the corners of his mouth or bulge his eyes or flatten his nose or ears. Westmore's methods were entirely different. With his assistant Jack Kevan, Westmore fashioned large foam rubber appliances that covered Cagney's entire face, except for the mouth and eyes. While these masks were much easier and faster to apply, they resulted in clumsy, bulky makeups with none of the power or naturalism of Chaney's original creations. 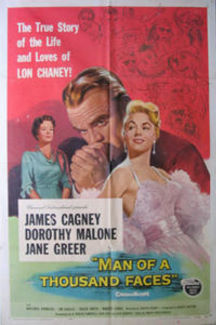 As John McCabe remarked in his biography Cagney, "one cannot create anything very frightening out of a cherubic countenance, which Cagney's basically was." This film initially came out on DVD in the very early days of the medium through Image Entertainment - June 1998 HERE. It's been out-of-print for a number of years and judging by this new dual-layered transfer we can safely assume this Universal DVD image quality is far superior. This new offering looks very impressive with good detail, strong contrast (good grayscale and black levels) and a healthy bitrate. The print used is exceptionally clean and this does not look, at all, like a 50-year old film. This DVD is anamorphic (original 2.35:1), dual-layered and progressively transferred in the NTSC standard - coded for region 1. I can't say this is a flaw, as I have nothing to compare it to, but at times the image looked a bit horizontally stretched. If it is - it's probably not much and the positive-ness of the transfer supersedes this possible weakness. 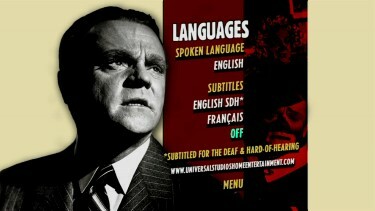 The 2.0 channel audio is clean and clear and there are English (SDH) or French subtitles available. Unfortunately no extras, which this film deserves, but the price is reflected in the bare-bones package. For less than $15 - this is a wonderful biopic (regardless of the inaccuracies) and an amazing performance by Cagney (perhaps his best). The DVD image quality encourages a purchase - regardless of the lack of supplements. Yes, we recommend.